Integrating your AWS account(s) with our platform is a two-stage process. First, you will setup a Detailed Billing Report (DBR) for us to ingest cost and usage data (read-only) for each payer account, which also automatically includes all associated linked accounts’ cost data. Note: It takes anywhere from 4 to 24 hours, depending on how long it takes AWS to generate the first DBR file, for cost and usage data first to appear in Cloudability. 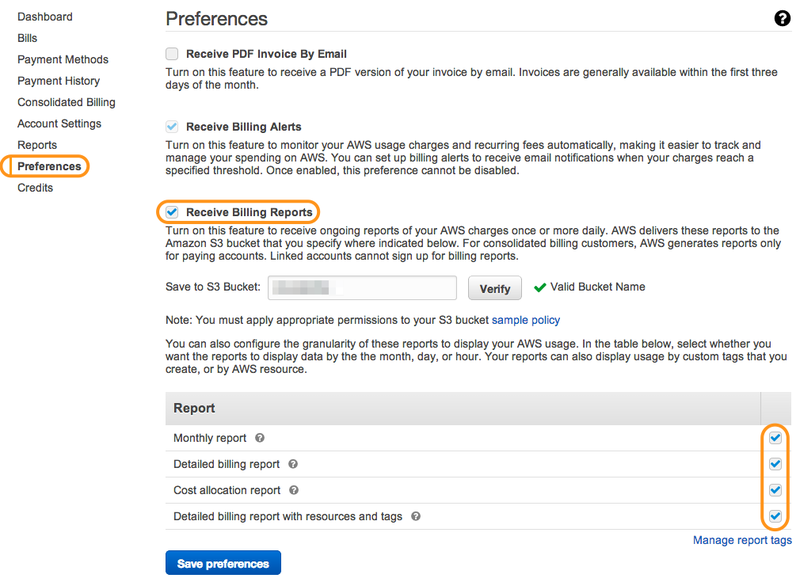 Section 1:Create S3 Bucket: Amazon creates your billing report and stores the report in an S3 bucket. You will need to use an existing bucket for the report or create a new bucket. If you want your billing report delivered to an existing bucket, skip to Section 3: Generate Access Credentials. Otherwise, proceed with the below steps. 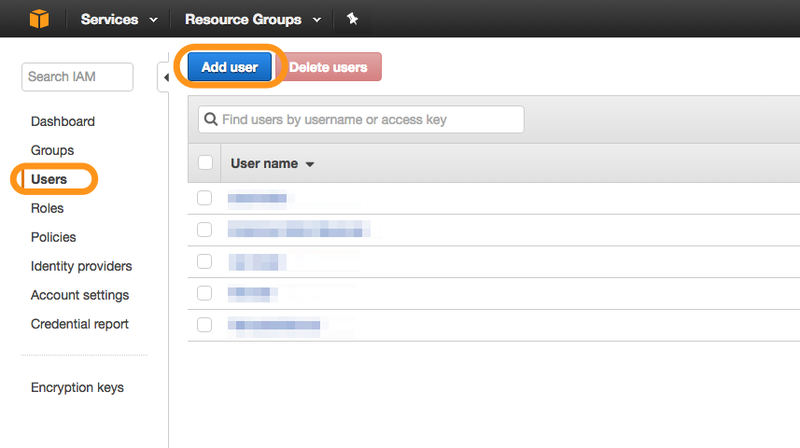 Log in to the AWS Management Console for the account you would like to integrate with Cloudability. From the Services menu, navigate to the Amazon S3 console. Type a name for your bucket in the Bucket Name box. Select region where bucket will reside. Next, determine who can access your bucket by setting bucket permissions. 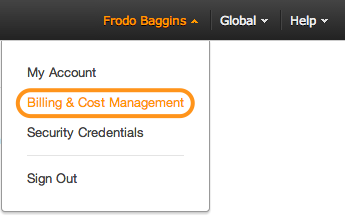 In the AWS Management Console, navigate to Billing & Cost Management. Under Receive Billing Reports, enter your S3 bucket name and select sample policy. Copy the policy. 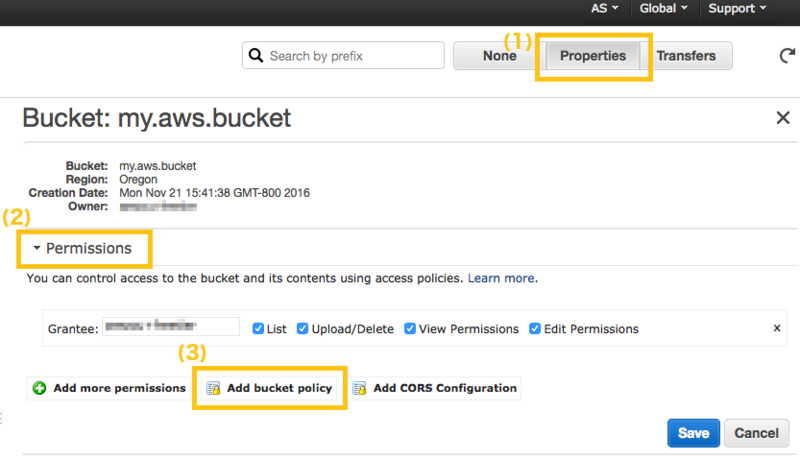 Navigate to the Amazon S3 console and select the bucket you created. Select: (1) Properties, (2) Permissions, and (3) Add bucket policy. Paste the copied policy and select save. 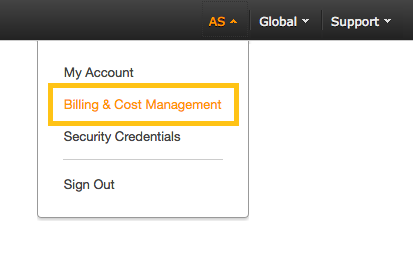 Navigate to your Billing Management Console by clicking on your account name on the top right of our AWS Management Console and selecting Billing & Cost Management. Select Preferences on the lefthand side. Click Receive Billing Reports and enable all billing report options (Monthly report, Detailed billing report, Cost allocation report, and Detailed billing report with resources and tags). 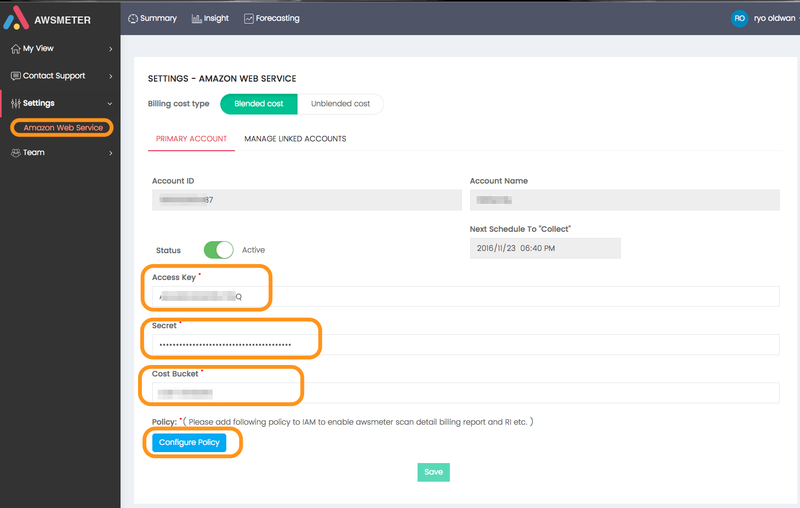 Click on Manage your tags underneath Detailed billing report with resources and tags to display a list of all the tags you have created and enable all tags that you plan to use for reporting in Cloudability. Note: If you have not yet implemented tags, we recommend doing so to separate and allocate your costs. Click here for more information on AWS tags. Section 3: Generating Access Credentials Note that it can take some time to process your AWS data within Cloudability. Assuming you haven't encountered any errors, please allow up to 24 hours for your cost and usage analytics to populate. 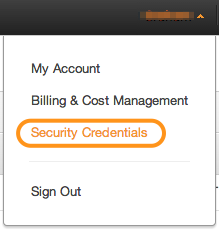 Navigate to your Security Credential Console (IAM) by clicking on your account name on the top right of our AWS Management Console and selecting Security Credentials. Select Users on the lefthand side and click Create New Users. Enter a user name and make sure to check the “Programmatic access” option. In a new tab, login to your FrugalBot account and navigate to your Amazon Web Service. To do this, mouse over left panel and click on Setting menu. 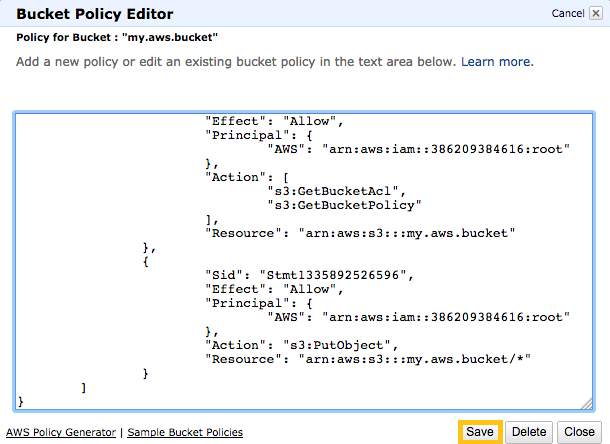 Enter the name of the bucket you created in "Create S3 Bucket" and click Configure Policy. Copy the newly generated user policy and navigate back to your AWS Security Credential Console (IAM). 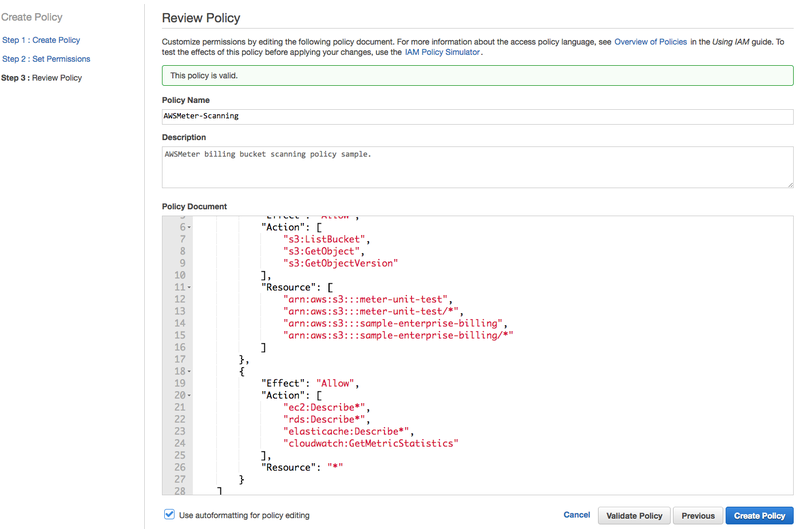 Select on Attach existing policies directly and click on "Create policy". Select the Create Your Own Policy. After creating new policy, navigate back Add new user tab, click Refresh and attach your new policy. Click Show User Security Credentials to reveal the Access Key ID and Secret Access Key. Navigate back to FrugalBot Amazon Web Service and enter your newly generated Access Key ID and Secret Access Key. Once you click Save Credential, FrugalBot will connect to your AWS account to verify your settings. Keep in mind this process can take 1-12 hours.